To help the homily, I’d like to show a very insightful five-minute video. Because Mass is so sacred, I don’t think we should normally show videos during Mass, but this will be an exception because we have a big problem and there’s so much to be gained from showing it. Everyone who’s seen this video agrees it describes reality very accurately. Our children are overindulged and are less happy because of it. Which problem did you find most disturbing? That they’re petulant, moody, and sullen? Don’t show gratitude? Want more and more things and never take care of them? That they get these things not by working, sacrificing, or doing their best, but by whining, demanding and manipulating? Their mental health has been going down since the 1950s, while depression is going up, and they’re becoming emotionally stunted, self-centered adults. So why do we overindulge them? Because we want them to be happy, which is good. Whatever other reasons there may be (e.g. we’re afraid of not giving them what other kids have, or seeing them disappointed; it’s sometimes more convenient/easier to give them what they want rather than argue) we need to recognize that they’re suffering because of it. I also believe we overindulge them because we are overindulgent as adults (including priests): We don’t focus on or use words like self-denial, self-control, sacrifice, discipline and the cross, so they never learn these concepts. The Church has just started the season of Lent: 40 days of self-denial and discipline. 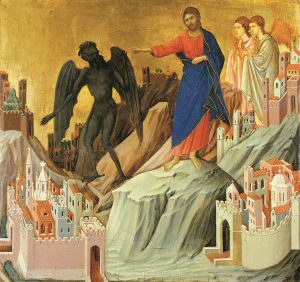 We’re imitating Jesus who went into the wilderness for 40 days, to show us, among other things, that we must control our desires. When we hear the Gospel, there’s a part in all of us that wants to follow Him into the wilderness. Why? Because we want a simpler life: more quiet, peace, and happiness. The point of today’s homily is a philosophical truth: discipline leads to happiness. The people we know in the best physical shape are disciplined; the best musicians, students, and business people are people who control their desires; those with the best relationships are those who are guided by reason: they love when it’s hard, they sacrifice rather than lust, they’re the first to calm down, etc. If we had a choice between controlling our diet, or eating whatever we want, whenever we want and however much we want, which one would we choose? If we favour indulgence when it comes to food, then we’ve fallen into the same mentality that leads us to giving our kids everything they want. Last April, we talked about four levels of happiness. Level one is pleasure and material happiness; two is ego satisfaction and comparing ourselves to others; three is helping other people; four is eternal happiness. People who eat whatever they want (and talk about food like it’s so important and may even take pictures of food!) have level one happiness, but will struggle to enjoy higher levels of happiness. One reason our kids’ mental health suffers and they get emotionally stunted is because, when we give them whatever they want, they get stuck at level one happiness. But it’s built into human nature to want more happiness. They just think, mistakenly, that they’ll get it if they get more things and have more fun! They haven’t realized that the solution is not to get more things, but to make a shift to higher levels of happiness! But to get to levels three and four, we have to sacrifice levels one and two. That’s why saying “No” to our children 75% of the time is a loving thing to do is because it forces them to shift upward! Jesus said, “I came that they may have life, and have it abundantly” (Jn 10:10). Jesus talked so often about self-denial, taking up our cross daily (Lk 9:23), and dying to self (Jn 12:24-25. See also Mt 19:21; Mk 10:29-30; Lk 14:33) so that we move to higher levels of happiness. So how are we going to do this? If we say “No” to the wants of our children 75% of the time, as Dr. Rosemond said, there’s going to be resistance: they won’t understand that we’re trying to shift them upwards. There will be a part of us that will feel badly because they’ll be sad, and other people, including our family and friends, will say we’re being too strict. But look at the facts. Watch that Vitamin N video again: our children are suffering and they need us to improve our parenting. Whenever we take away something they want, let’s instead give them more of what they need: protection, affection and direction. It’s important that we parents who say “no” give more love and affection than other parents! When we keep this in mind, that we’re doing it for their long-term happiness and giving them more love, it’ll be easier for mom and dad to agree (because sometimes mom and dad are divided: one is more lax, one is more strict). Most importantly, we ourselves have to practice discipline and self-denial. If we don’t, we’ll never be able to teach our children because they’re very observant and imitate us. First, let’s work on one thing as a community, to build a culture of discipline: respect in church. I have to thank everyone for being so reverent and quiet; we’ve made huge strides here. But we still need to improve. God speaks in silence, so I’m asking once again, especially for those who are new to our parish: When we enter this church, we should not talk. We’re in the presence of God Himself in the tabernacle. Our world is very noisy, and the one place people should expect to find silence is in a Catholic church. Before Mass starts, therefore, when we’re waiting inside the church, we shouldn’t be talking. If we truly need to, then let’s whisper. Since the church should also be the most friendly place in our society, we can still greet each other by smiling and with a gentle wave, so as not to disturb people praying. When Mass is finished, we must have the self-control to wait until we’re outside to talk. Also, when we’re in the vestibule, we should not be talking at all until the last hymn is completely finished. People are trying to pray back there too, so it’s an act of charity. People have also told me that some people are on their phones while in church—that’s not polite. I suppose some people have their prayers on the phone, but anything else is actually rude. Prayer is the most important: 15 minutes a day is what we need for a good relationship. One help is to set an alarm on your phone for a certain point during the day. If we go to bed tonight, for example, at 11 p.m., we should set an alarm for 10:30 p.m. When the alarm goes off (it must be the sound of church bells), then it’s time to pray. Set a second alarm at 10:45 p.m. which signals when we’re done. 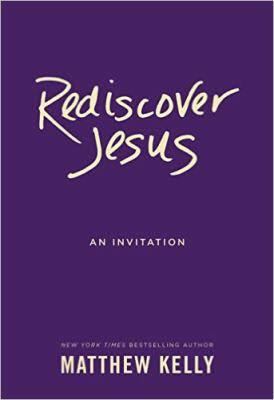 Try also reading our Christmas book Rediscover Jesus. It’s 40 chapters, perfect for Lent, and each has a point to ponder, a verse to memorize, and prayer to make. What about controlling our diet? Jesus recommends fasting. What about no coffee… for one day a week? Less sugar, less salt, no dessert? Or limited texting, social media, internet surfing? How about not buying anything except necessities during Lent? (If you have doubts about what’s necessary, come to me. I’ll tell you what qualifies.) Whatever we save, let’s give it to charity. When we wake up, can we wake up when the alarm first goes off and not hit the snooze button? It’s called the “Heroic Minute;” it’s when heroes are made. And we can’t look at our phones until we have prayed our morning offering. For your information, Sunday is not a day of penance, because it’s the day of the Lord’s Resurrection. This is good to know because, when we take on a Lenten penance, it’s helpful to have a day of rest from the penance. One year, for instance, I gave up watching the Olympic hockey for Lent, which is hard because it only comes every four years, but on the day of the finals, Sunday, other seminarians said to me, “C’mon, Watch with us. It’s Sunday!” So I did. Let’s choose just one act of discipline, make it concrete or write it in our journal. Let’s do it for our kids! Think about the image of a jar. 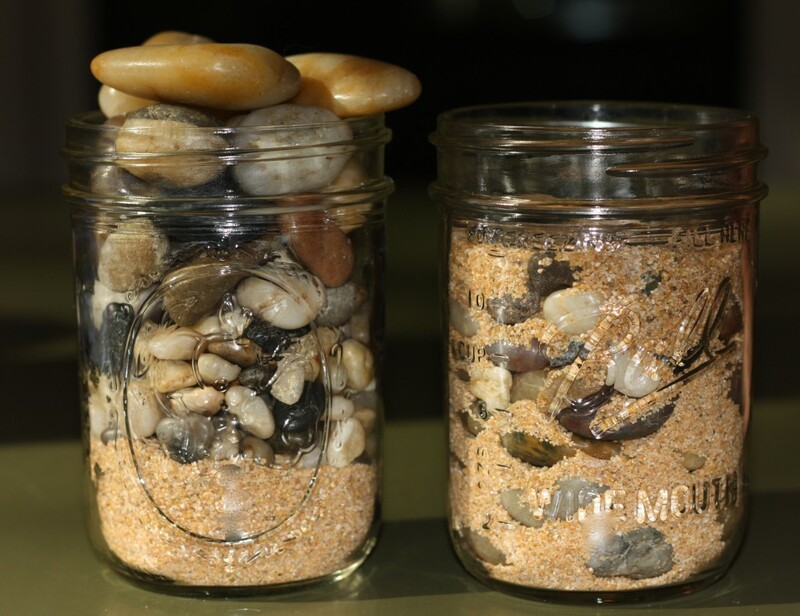 If we fill it with sand, which represents the least important things in life, there will be no room for a huge rock and pebbles, which represent God and the more important things. But, if we put the rock in first and then the pebbles, and then the sand, there will be room enough for all of them; they simply must be in proper order. 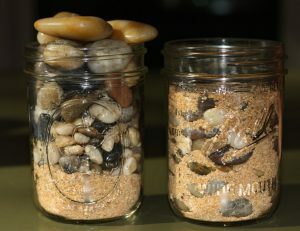 If right now our jar or our kids’ jars are filled with sand, then we have to empty them out a little, which means saying “no,” so that we can put in the huge rock. We’re shifting them from lower levels of happiness to higher levels. It’s this discipline that will lead to happiness.